Local waterfront organizations attended CB6’s Land Use and Waterfront committee meeting to provide options for East River access. 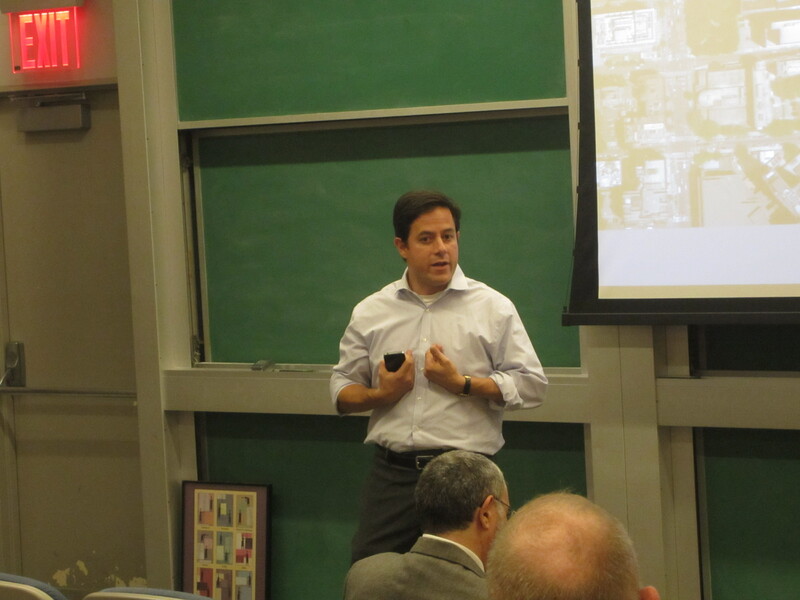 At the committee’s October meeting, City Council member Dan Garodnick called on community members and organizations to come up with suggestions for how to use the $1 million in funding that his office has secured for East River access so representatives from waterfront groups returned in November to offer their proposals. Stuyvesant Cove Park has served as a launching point for kayakers for the last three summers and representatives from the Watertrail Association, Long Island City Boathouse, Urban Swim, the Lower East Side Ecology Center and Metropolitan Waterfront Alliance have been working to provide easier access to recreational boating on the East Side. The area of the East River around Stuyvesant Cove Park has a natural beach, which has made it an adequate launching site for kayaks when the tide is low, but one of the main problems is access to the beach itself. During the summer when free kayaking events are available, there is usually a cooler for kayakers to step over and a ladder to get down to the beach, making it difficult and precarious to get to the boats. “It gives people the impression that they’re doing something they shouldn’t be doing,” Nancy Brous, of the Watertrail Association, added. Ted Gruber, a volunteer with the Long Island City Boathouse, was skeptical that any of the proposals would be implemented by next season and suggested that an interim solution be used in the meantime. Brous outlined the plans for the eventual kayak launch that would potentially be functional by the summer of 2016 and which would include permanent storage for boats, a floating dock and educational space. Gruber emphasized that storage space for boats is crucial because it increases the number of volunteer hours to have to transport the boats back and forth between other storage facilities and the water. 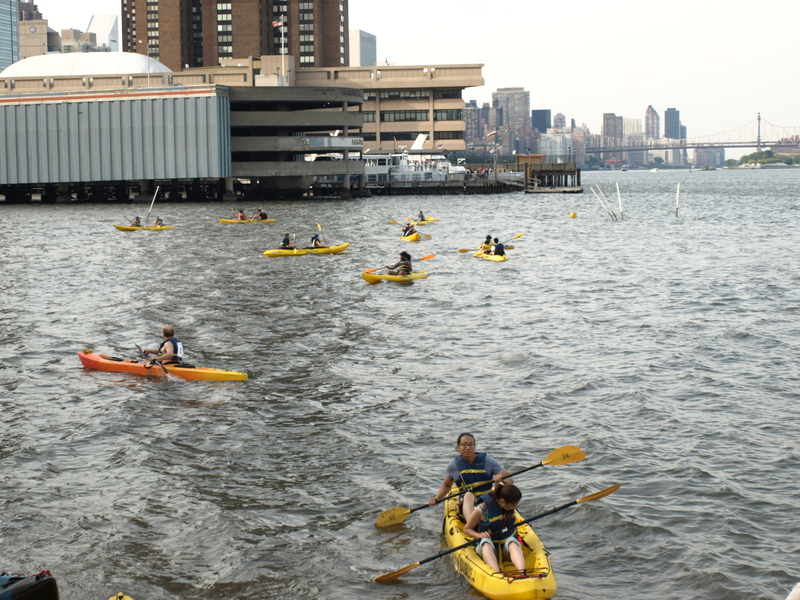 Steven Leslie, a resident of East 24th Street and Second Avenue, created a Stuy Cove Kayaking listserv and has been working on programming to get residents involved with the water. He said that the educational space is a key part of getting children and students interested in the water quality and environment. “We could liaise with local schools because the park is already a place where a lot of students come for educational activities,” he said. The committee ultimately proposed a resolution to support the plans for a floating dock and a 3,000 s/f structure with an educational component, as well as the interim solution of moving the gate to make the beach more accessible. 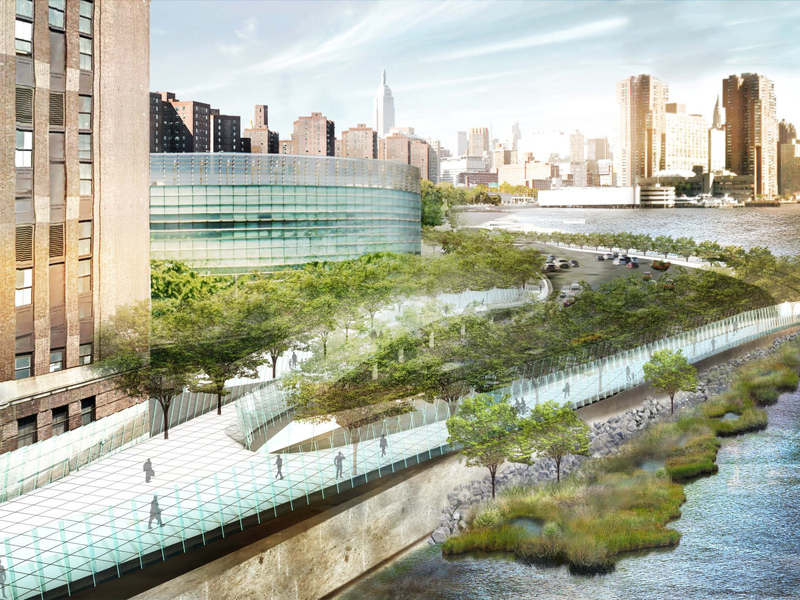 A rendering depicts the East River waterfront after the addition of wetlands and trees. 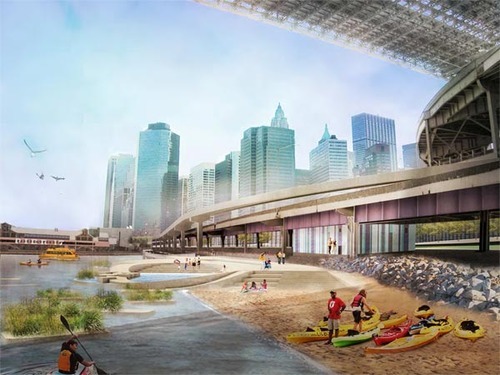 Last Thursday, a plan was announced for the redevelopment of the East River waterfront from the Brooklyn Bridge to 38th Street, which would not only add a number of recreational water-related activities for area residents but also protect the East Side from a future Sandy-like disaster. The plan, which has been in the works for over a year through a study conducted by Borough President Scott Stringer and Assembly Member Brian Kavanagh, not to mention the input of dozens of agencies and community groups, has yet to be formally discussed in detail. However, some of the major aspects of the project, which could cost “in the tens of millions,” said Stringer, have already been provided for, such as $3.5 million allocated by the borough president for the addition of wetlands, specifically salt marshes, to spots along the riverfront. The man-made wetlands would be extended from the shoreline and serve a few purposes. One is to add drainage under the FDR Drive to prevent flooding like that experienced during Sandy in the event of another storm. Other functions of the wetlands would be to help improve the overall quality of the water in the river and to encourage pedestrian access to the water. This is an image of the proposed Blueway footbridge and storm surge barrier, looking north toward Stuyvesant Town and Stuy Cove. In addition to providing greater pedestrian connectivity, the bridge would also serve as a flood barrier for the Con Ed steam plant. The salt marshes would be placed along the areas from the Brooklyn Bridge to Rutgers Slip and Stuyvesant Cove to around East 14th Street. They would improve water quality by helping to absorb some of the combined sewer overflow, which has a habit of showing up in the river at certain points after heavy rainfalls. Renderings for the plan, created by W X Y architecture + urban design, also show a number of new trees lining the area of what’s being called the East River Blueway. Other parts of the plan for the Blueway include transforming the roof of the Skyport Garage into a garden and recreational area with some sort of food service and opening a boat launch on a floating dock for kayaks and other man-powered boats by Stuyvesant Cove Park as well as a kayak launch by the Brooklyn Bridge. According to Kavanagh, the boat launches would actually be one of the less expensive aspects of the plan though it’s already proved to be a popular one. 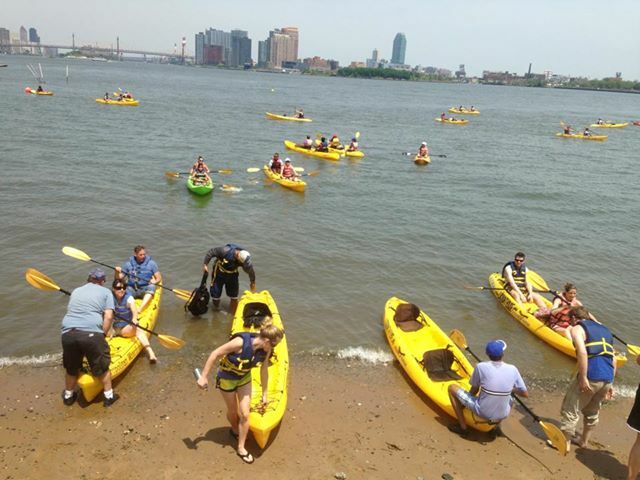 Last August, a kayak launch was organized at Stuyvesant Cove Park that was a huge hit with area residents. The event didn’t happen randomly though. Man-powered boat launches would be part of the Blueway plan by the Brooklyn Bridge and Stuyvesant Cove Park. The kayaks would be included in the floating dock feature. The plan also calls for an elevated footbridge to be built at 14th Street and the FDR Drive by the Con Ed steam plant. This would eliminate what’s become known as the “choke point,” where the foot and bike path is at its narrowest — four feet and six inches. It will also serve as a water barrier that, as it turns out, Con Ed needs if there’s a storm surge in order to prevent blackouts in the area. This would probably be one of the more expensive projects to execute, but also one of the most necessary, said Kavanagh, if just to relieve traffic at the choke point. “As we continue to encourage waterfront projects, you get more people into this street,” he said. As for the proposal for the Blueway, Stringer said over 40 stakeholders have been consulted so far from Con Ed to various city and state departments to elected officials to tenant groups like the Stuyvesant Town-Peter Cooper Village and Waterside Tenants Associations and the Murray Hill Neighborhood Association. The Lower East Side Ecology Center and Community Boards 3 and 6 have also been involved and are considered community partners. There will also, Stringer noted, be many more opportunities for the community to weigh in, including in a few weeks time when more details are rolled out. The borough president and comptroller hopeful, who announced the plan in his state of the borough address, added that he also thought of the Blueway as “a model for the whole East Side and the whole city. Stringer added that he wasn’t too worried about securing the funds for the project, despite its hefty estimated price tag. Compared to the over $60 billion in Sandy aid that’s become available and the billions in infrastructure that would be protected, “It’s really pennies on the dollar,” he said. Kavanagh agreed about the funding, noting that the plan was still just that, in the idea phase, for the longterm vision of the East Side waterfront. 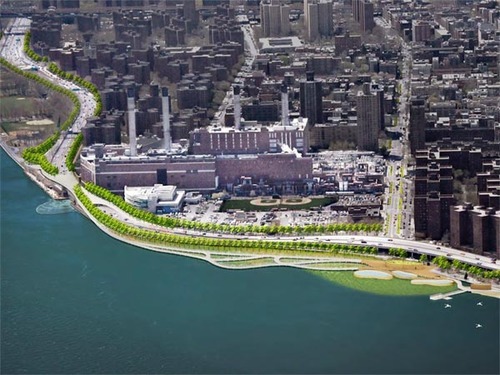 The Blueway follows another proposed huge project that envisions a greener waterfront, the East River Greenway plan. The Greenway project includes expanding the United Nations campus and building a promenade from 38th to 60th Streets.